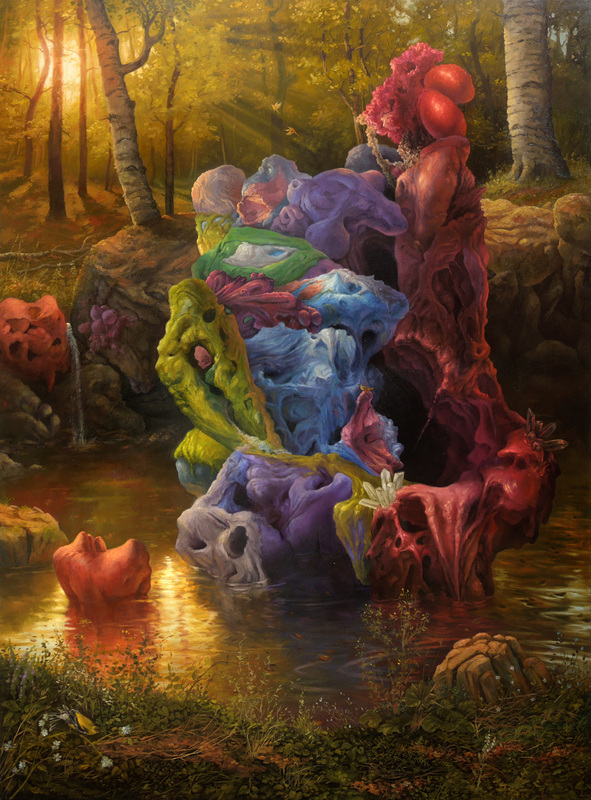 Adrian Cox is a painter based in St. Louis, making large scale landscape-based work that references both the grotesque and the bucolic. The paintings appear lush and carefully crafted in a way that seems to be defiantly unfashionable in this decade of the squeegee and exposed stretcher bars. Cox has a show up at Manifest Gallery in Cincinnati titled Border Creatures and is giving a public talk at the gallery tonight (Friday, May 15). Border Creatures closes tomorrow but I am sure that Adrian’s work will be on view again, hopefully soon. See more of his work at his website. What follows is Adrian Cox’s response to this challenge. We want to thank Adrian for responding to this experiment and taking time to provide these words for us. You will enjoy what he has to say. What aspects of your work were you initially dishonest about? That is to say, what important parts of your art making experience did you try to compromise or hide as an emerging artist? This is as much a question that I would like to ask myself in the future as one that I consider now. I’m fully aware of the compromises caused by the functional limitations of being an emerging artist (who doesn’t want a bigger studio? ), but I’ve only recently begun questioning other self-imposed limitations. There are certain aspects of my practice that never seem to make their way into exhibitions. My studio is filled with sculpted maquettes that I use as studies for paintings, and while I’ve been using such devices for years, I still find myself uncertain of my relationship to these objects. Right now they’re a means to an end, but I increasingly find this excuse to be an easy way to separate the illusionistic world of representational painting from the weighty objecthood of sculpture. I’m unsure of whether these studies will remain a tangential aspect of my studio work, or transform into something else entirely. Which painters have remained important to you over the years? Why have you cast aside those that no longer play such a central role in your practice? I’ve always held that you can get an sense of an painter’s practice from the artists they love; more so from those they hate. When I think about the reasons that I’ve turned away from certain artists that were once central to me, I find myself considering weaknesses in my older work. Likewise, the painters that have grown on me over time reflect moments in which I’ve set forth in new (hopefully better) artistic paths. It’s in the space between these artists that I’m able to measure my growth as a painter. My studio is littered with printed reproductions and dogeared monographs; I can’t help but wonder which of these will stand the test of time. Do you still feel a need to justify painting? People constantly remind me of the weighty bulk of my chosen medium’s history, and challenge the artistic and cultural viability of painting. Publicly, I always offer my best conceptual defense for what I do, but in the privacy of my studio I find myself viewing the vastness of painting’s history as more fecund than burdened. Every time I pick up a brush, it’s as if I’m having a séance with my artistic heroes. The discourse surrounding painting is constantly shifting between more or less critical positions, but the intimacy of the medium persists. I can’t guess what position toward painting will become fashionable years from now, but I have to wonder if I’ll still feel the need to leap to its defense at every opportunity. Perhaps my words aren’t needed. The smeared, scrubbed, glazed, and scumbled surfaces that I see in galleries and museums probably offer a more eloquent argument for their own existence than I ever could.